by descent to a private collector, California; previously acquired in London either in the 1930s or between 1945-1955. The lid is hinged and there is a loop to allow for locking. Inside, there is a silver filigree panel with six circular holes to allow for six bottles to be inserted. 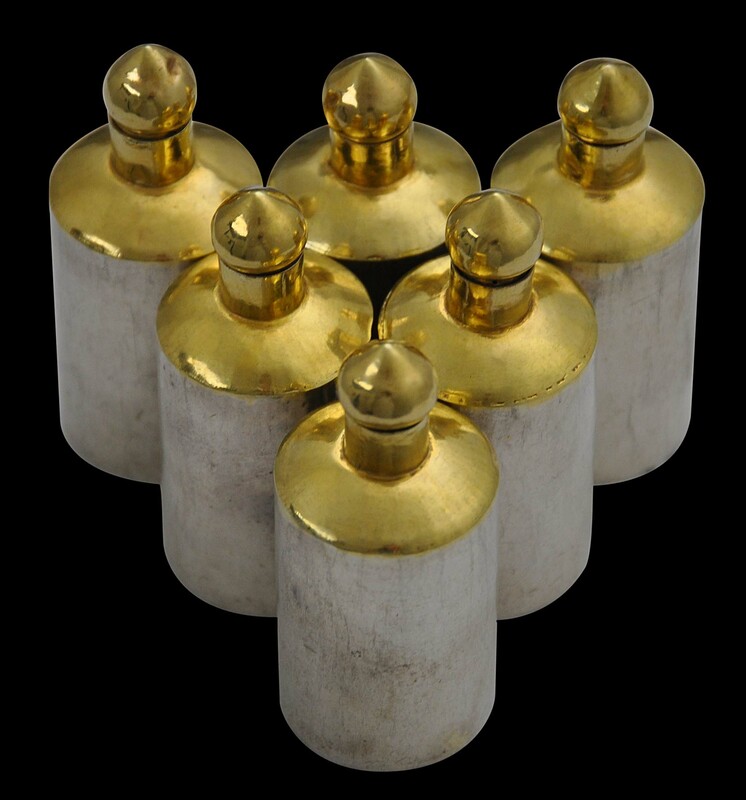 The six bottles are of plain sheet silver, the shoulders and stoppers are gilded, providing a highly effective contrast with the rest of the silver. 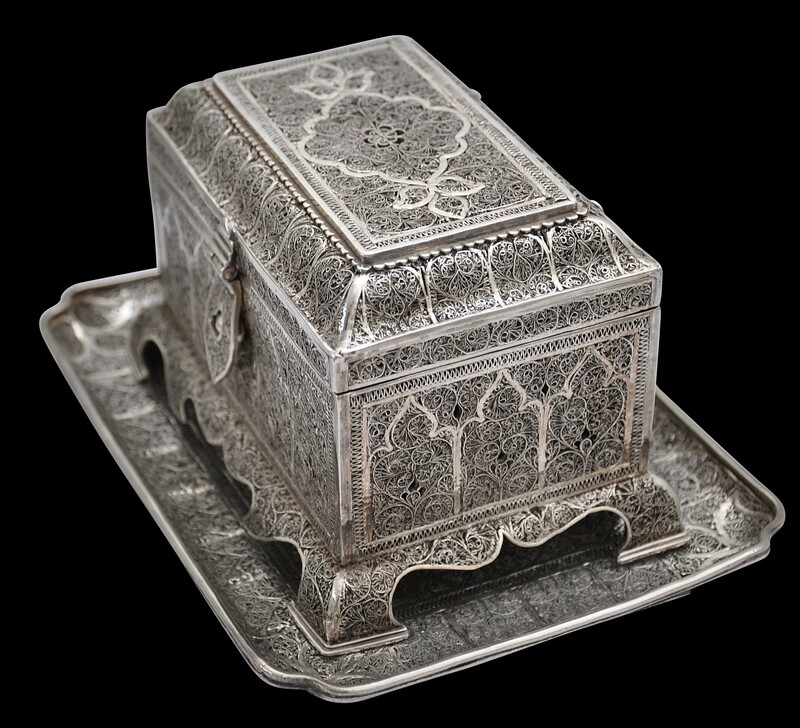 The casket sits with the aid of four filigree feet on a rectangular tray with gently concave sides that also is entirely composed of silver filigree. The set is important for several reasons. Foremost, it is very similar to a celebrated example in the British Museum (BM) displayed in the Addis Gallery of Islamic Art. (The British Museum’s Tipu Sultan set has been published many times, including in Strong (2009, p. 50), Terlinden (1987 , p. 49) and Zebrowski (1997, p. 45), and analysed in a paper prepared by Sarah Longhair and Cam Sharp-Jones of University College London which can be found here.) The BM’s example is believed to have been seized by the British from Tipu Sultan’s palace at Seringapatam in 1799 – a set that hitherto has been considered unique. The tray that accompanies the set here clearly is contemporary with the casket and was made for it. This suggests that the BM’s example also was intended to have a tray and so is incomplete. Both the example here and the British Museum example each hold six similar silver perfume bottles but importantly the bottles are fitted into a custom-made interior plate with six holes, fashioned from the same type of filigree work as the outside casket, demonstrating that both boxes were made to hold the perfume bottles and that these are not later inserts. 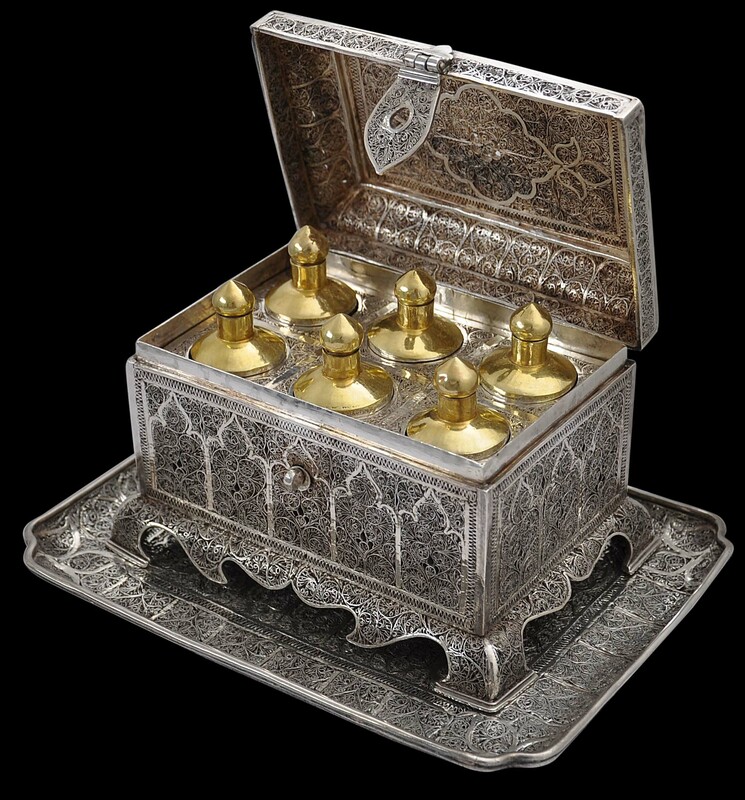 Hitherto, the British Museum example was the only known example of a silver filigree box of this type demonstrably made to house a set of perfume bottles. Now, there is another. The two sets undoubtedly were made at a similar time and perhaps by the same hand. Quite possibly, the set here also came from Seringapatam. It was acquired from a collector whose forebears purchased it from an antique shop in London as early as the 1930s, and as will be discussed, many items were looted from Tipu Sultan’s palace and were distributed among the British forces and brought back to Britain. had such, or indeed any, chains. The BM set includes a small funnel and a ladle. These slide into small, custom-made holes in the filigree sheet that holds the bottles in place. The example here does not have any such funnel or ladle but nor are there any spaces for them to be inserted. Clearly, unlike the BM example, it never had such implements. (The funnel of the BM set has a barely visible inscription in Persian which translates as ‘Hyder’ which might be a reference to Tipu Sultan’s father Hyder Ali, or it might be a reference to the Prophet’s son-in-law.) There are slight differences in the pattern of the filigree between both boxes, but largely it is the same. 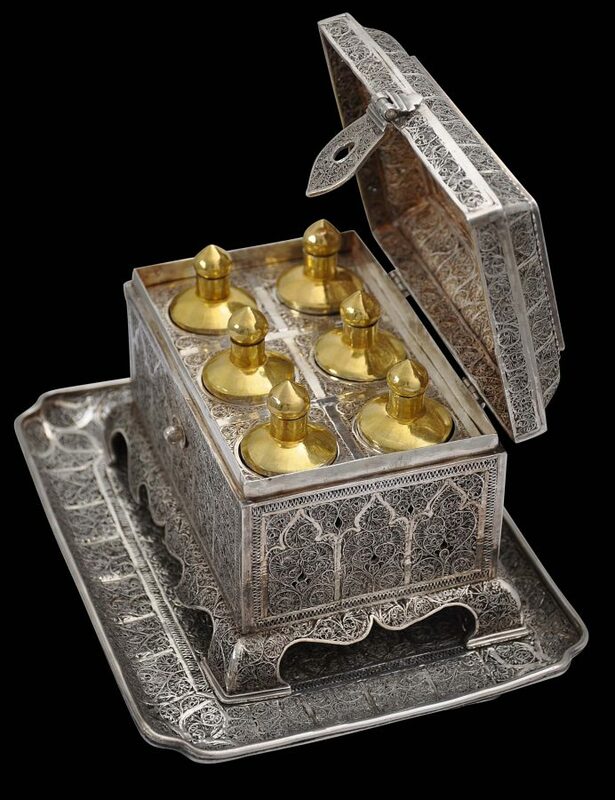 The sets would have been used for holding and mixing perfumed oils and waters particularly in connection with festivals, dinners and other similar events to add to the luxurious atmosphere. The presence of a hinged lock suggests that such scented oils and waters were costly and needed to be safe-guarded. Tipu SultanTipu Sultan – the ‘Tiger of Mysore’ – lived on a fortified island known as Seringapatam surrounded by a river, in his kingdom of Mysore. His father Hyder Ali had captured the kingdom and Tipu succeeded him as its ruler. Tipu became increasingly close to France, which alarmed the British who feared France’s expansion into the sub-continent. The Seringaptatam fortifications included a palace that housed a magnificent library of thousands of illuminated manuscripts and the toshkhana – a jewel house that held precious stones, pearls, jewellery, bullion, state documents and other important and luxury items. The entrance was guarded by chained tigers (Strong, p. 16). 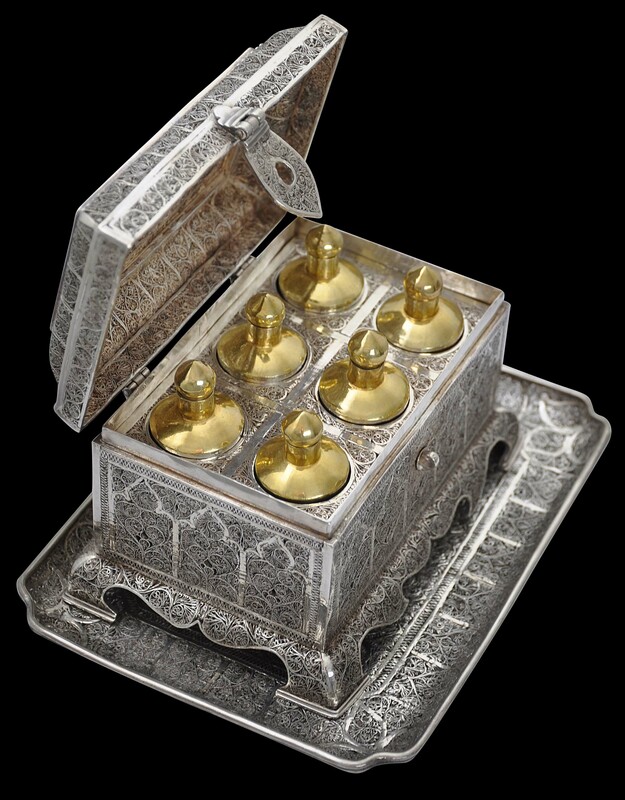 Tipu Sultan’s court workshops made silver items such as howdahs for the court’s use but also to be given as diplomatic gifts. Ambassadors were sent to the Ottoman empire, to France and to the Isle de France (now Mauritius) with luxury goods produced by the workshops (Stronge, p. 18). Other luxury goods were imported from elsewhere in India, Europe, Iran and China. Tipu Sultan actively encouraged foreign trade. Embassies were sent to Istanbul and Paris to foster not just military links but also trade links. Tipu Sultan was a great collector. Visitors who saw his collection of luxury goods prior to the fall of Seringapatam described it as ‘stupendous’ (Jasanoff, 2006, p. 184). The items came from around the world. Large quantities of gold and silver artifacts were seen in the palace when it fell in 1799 but little of it has survived. ‘Tipu Sultan’s treasury was initially plundered, and then formally distributed. Its wide dispersal has concealed from history the nature and extent of the arts of this most significant court of the eighteenth century’ (Stronge, p. 47). 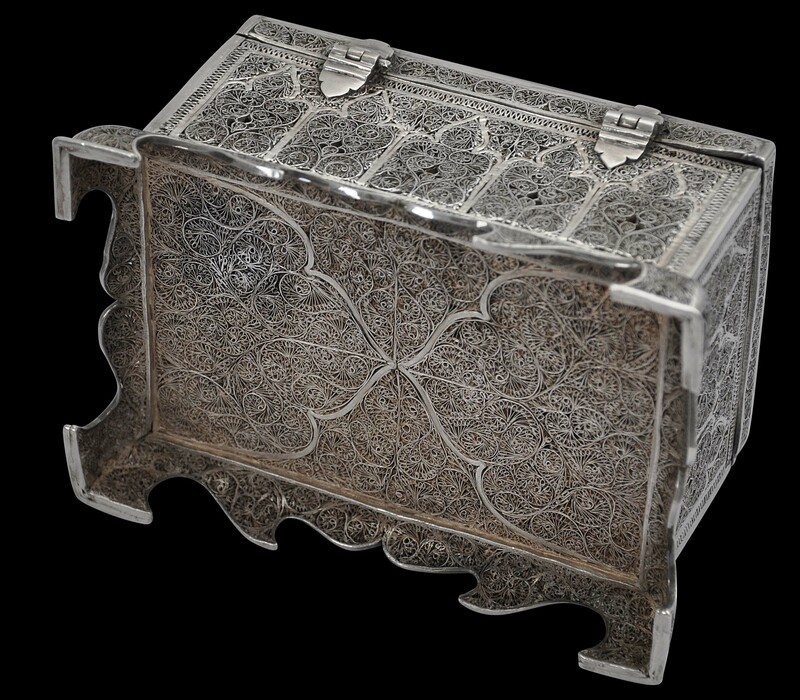 The filigree box in the British Museum is one example. A large, Chinese-style salver in the Victoria & Albert Museum, is another. The plundering that occurred essentially was illegal and for at least some time, the commanders turned a blind eye. But the process of taking ‘prizes’ was a more orderly affair governed by acts of the British Parliament whereby a prize committee was established and items were assessed and shared out according to rank. The items taken as prizes were brought to a tent at Seringapatam from where they were distributed. 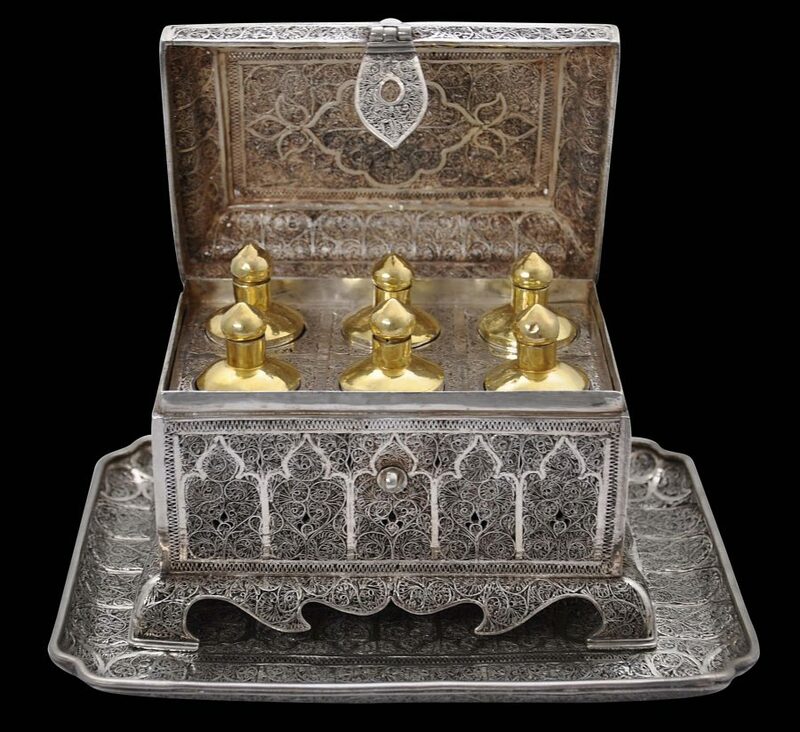 No record exists of all the transactions that took place but according to Jasanoff (2006, p. 183), surviving receipts show that officers acquired ‘collectibles’ such as silver betel boxes, silk carpets and ornamental weapons. Tipu Sultan’s throne was broken up and the pieces distributed. The British were keen to remove from Seringapatam as many items as possible associated with the person of Tipu Sultan lest they become rallying points and relics of the late ruler. Jasanoff (p. 181) talks of the Sufi concept of barakat, whereby objects associated with an esteemed individual are thought to be imbued with his charisma (barakat) and contact with them will bestow blessings. But ironically, it was the British themselves who became enamoured with relics of Tipu Sultan and there developed a craze – ‘Tipumania’ – among them in India and back in Britain for collecting such memorabilia. Indeed, the British fascination for Tipu Sultan, which only grew after his defeat, was out of all proportion to the relatively small size of his kingdom and his power. Where was the Set Made?The place of manufacture of the BM example (and by implication, our example) variously is put as either Goa or Karimnagar in the Deccan (Loghair & Sharp-Jones, 2013). The possibility of it having come from beyond India is not considered. And yet, part of the allure of luxury goods is that they are not produced locally but from afar which adds to their novelty and rarity: the powerful and wealthy owned them because they werenot made locally. 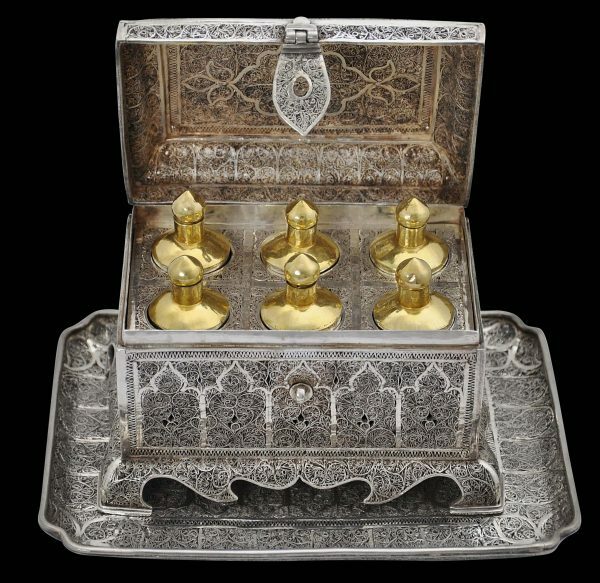 It is possible, even likely, that this perfume set and that in the British Museum were not made in India but in Batavia, by Muslim craftsmen. Certainly, Tipu Sultan and his father Hyder Ali showed a propensity for foreign-made luxury goods, as witnessed by the Sevres porcelain that was taken from Seringapatam after it fell, some of which is now in the Clive Collection at Powis Castle. The proximity of Mysore to the Coromandel Coast, where VOC ships were frequent visitors and where the VOC had established trading ports and factories would have made Tipu Sultan and his father accessible clients for the VOC’s luxury goods. Mysore is also relatively close to Sri Lanka, where the VOC had important trading operations in Galle, its second most important harbour after Batavia. The main objective of the VOC was to bring spices from Asia to Europe. But the VOC also established a complex series of intra-Asia trade networks whereby items were purchased in one part of Asia to be sold in another for profit. One study identifies 1,059 ships in the employ of the VOC which routinely took part in trade within Asia between 1595 and 1660 (Parthesius, 2010, p. 13). Textiles were a mainstay of intra-Asia trade but other consignments included luxury goods, timber, Chinese porcelain, and even elephants. Items of silver were produced in and near Batavia at the behest of the VOC and there was a history of silver filigree production in the area. William Marsden in his treatise on Sumatra first published in 1784 includes an extensive description of gold and silver filigree work carried out in Sumatra, with the observation that: ‘there being no manufacture in that part of the world, and perhaps I might be justified in saying, in any part of the world, that has been more admired and celebrated than the fine gold and silver filigree of Sumatra. This indeed is, strictly speaking, the work of the Malayan inhabitants’. 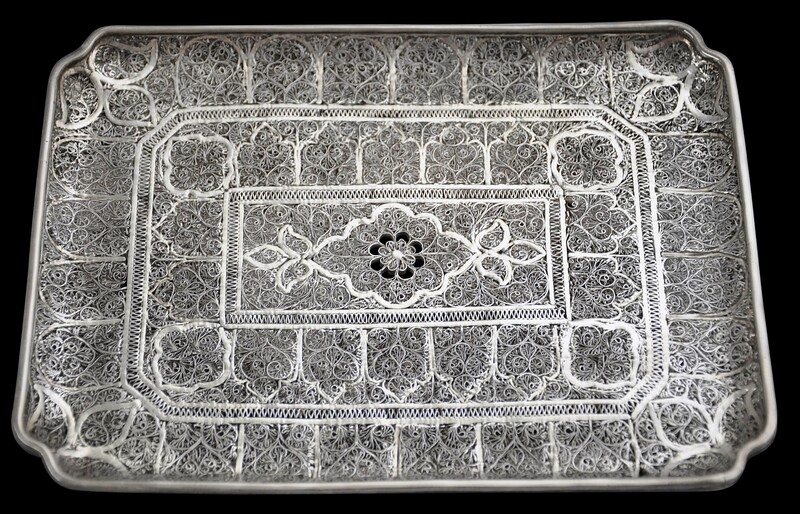 He adds that ‘The [local] Chinese also make filigree, mostly of silver, which looks elegant, but wants likewise the extraordinary delicacy of the Malayan work.’ Sumatra was an important market for Indian-made textiles imported by the VOC. 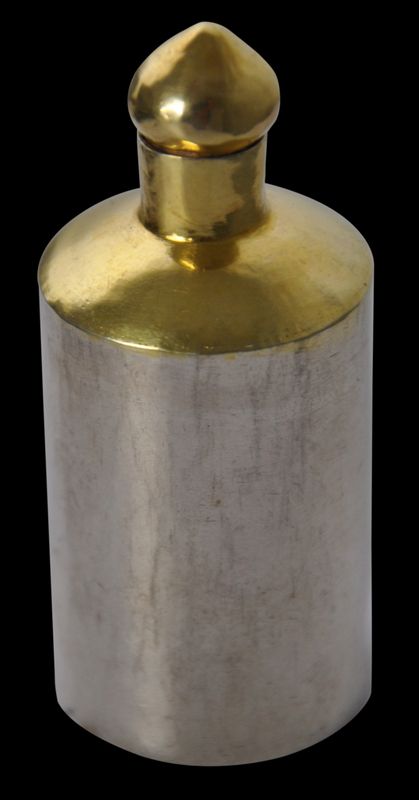 Pepper and gold were among the goods that the VOC received in payment. Undoubtedly, filigree work was too, all of which would have been trans-shipped through Batavia. In any event, items of filigree need not have been imported to India from Batavia by the VOC itself. VOC officers were quite poorly paid with their salaries scarcely rising at all in a hundred years. Instead, the Company turned a blind eye to unofficial trade being carried out by its officials in their private capacity. They were allocated chests aboard Company ships for their private effects but typically would bring only enough personal items to fill (say) one chest leaving another five (say) available for goods that they would trade privately. The practice was so commonplace that it was routine for officers to borrow many times their salary ahead of a voyage to buy items that they would trade on reaching their destinations. Company directors observed that ‘the senior merchants, junior merchants, skippers, officers, assistants, and all other persons in the service of the Company’, were trading in ‘the best and finest porcelain, lacquer-work, and other Indies rarities contrary to their oath of engagement’ (Marsden, 1985, p. 28). 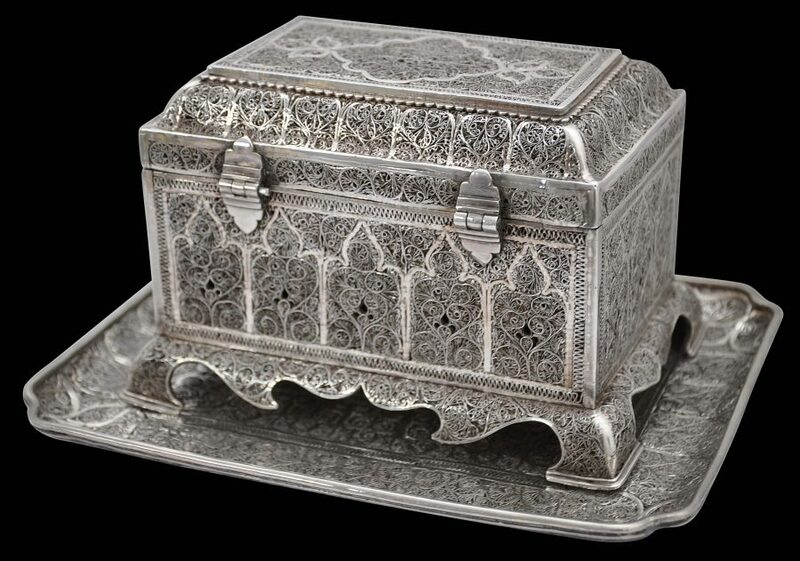 In addition to this, the casket and tray include thin, silver filigree zig-zag borders of a type that is seen in items of silver filigree that might be attributed to Batavia or its environs. The BM example also has this zig-zag. Assigning this motif to Batavia/Sumatran filigree is speculative but much is when it comes to the origins of filigree. Overall, the set here is extraordinarily rare. It is a partner piece to the Tipu Sultan example and shows that the Tipu piece most probably should have had a tray. It might not have come from Seringapatam but probably has the same maker as the Tipu Sultan set. Both probably were made in the Indies, but the sub-continent might still be a possible place of manufacture. The condition is excellent (indeed it is in better condition than the British Museum example), particularly given its age. There are few, if any losses, and no repairs. It is an important, museum-worthy object. Jasanoff, M., Edge of Empire: Conquest and Collecting in the East 1750-1850, Harper Perennial, 2006. 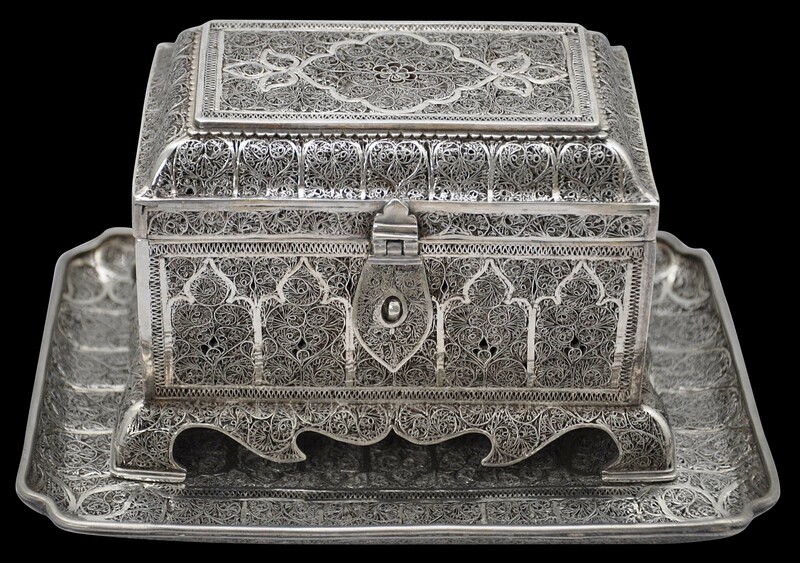 Loghair, S., & C. Sharp-Jones, ‘The attar casket of Tipu Sultan’, research paper produced in association with the ‘East India Company at Home, 1757-1857’ project, Department of History at University College London, 2013. Marsden, P., The Wreck of the Amsterdam, Hutchinson, 2nd ed., 1985. Marsden, W., The History of Sumatra: Containing an Account of the Government, Laws, Customs and Manners of the Native Inhabitants, with a Description of the Natural Productions, and a Relation of the Political State of that Island, 1784. Mohsin, M., Ivory for a Tiger?, Sir John Soane’s Museum, undated. Parthesius, R., Dutch Ships in Tropical Waters: The Development of the Dutch East India Company (VOC) Shipping Network in Asia 1595-1660, Amsterdam University Press, 2010. Piotrovsky, M.e t al, Silver: Wonders from the East – Filigree of the Tsars, Lund Humphries/Hermitage Amsterdam, 2006. Stronge, S., Tipu’s Tiger, V&A Publishing, 2009.